This GE Profile 2.1 Cu.Ft. Over-The-Range Microwave Oven fits in the space of your range hood. It is equipped with a ventilation system and lighting system for the range below. It features Electronic Touch Controls with 10 Power Levels which offers the flexibility to accurately cook any meal, from frozen entrees to refrigerated casserole dishes. It also features Child Lock Out which allows you to lock the control panel to prevent the microwave from being accidently started or used by children. 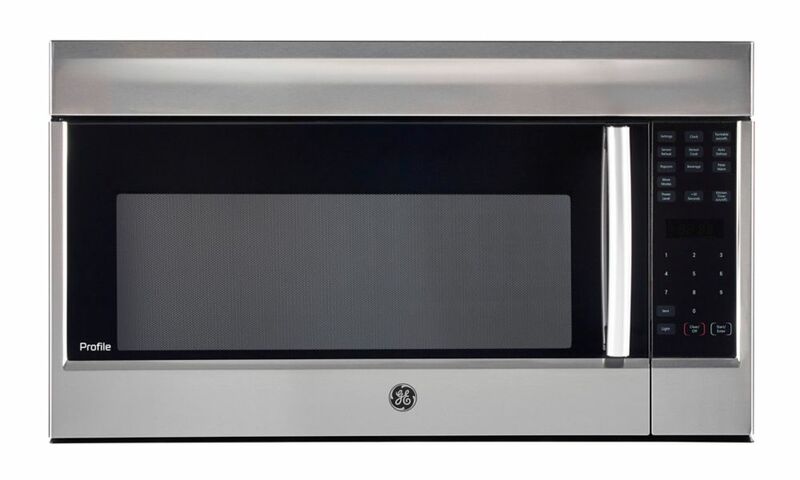 Take back your counter space with this beautiful built-in microwave from GE. Featuring electronic touch controls, digital display and child-safety locks, this powerful and convenient unit is the perfect addition to any kitchen. Plus, when ordered with the matching trim kit, it seamlessly blends in with the rest of your cabinetry and finishes. Set the GE SpaceMaker on a countertop or build it seamlessly into your kitchen cabinets with one of the many optional kits available, either way you're sure to love all of its innovative features! The Electronic Scrolling Digital Display gives you ultimate flexibility - program several functions at once for meal preparation. The Instant-On Popcorn Button maximizes popping without scorching your favourite snack, and the Child Lock-Out function allows you to lock the control panel completely to prevent the microwave from being accidentally started or used by children. The GE Profile over-the-range microwave lets you heat and cooking foods quickly. The over-the-range design frees up valuable counter space in your kitchen, giving you more room for prep. It has an extra-large 2.1 cu. ft. capacity with Easy Clean interior that combine to give you lots of space for cooking large items. GE Profile 2.1 CF OTR Microwave This GE Profile 2.1 Cu.Ft. Over-The-Range Microwave Oven fits in the space of your range hood. It is equipped with a ventilation system and lighting system for the range below. It features Electronic Touch Controls with 10 Power Levels which offers the flexibility to accurately cook any meal, from frozen entrees to refrigerated casserole dishes. It also features Child Lock Out which allows you to lock the control panel to prevent the microwave from being accidently started or used by children. GE Profile 2.1 CF OTR Microwave is rated 2.3 out of 5 by 3. Rated 1 out of 5 by Mark from DO NOT BUY this microwave! 1) If you had an old GE microwave, don’t buy expecting easy installation. Every one seems to have a different hole pattern. I had to re-drill every single hole. 2) Having to remember codes for various foods to use the sensor cooking is ridiculous. Why can’t the screen say the food name instead of the arcane code? 3) After submitting a review a month ago, which Home Depot accepted, they continue to spam me asking for a review. So here it is again. Rated 5 out of 5 by Jules29 from Great features I am very satisfied with this item. Has many features my previous microwave did not.